Cavalli marks the 40th anniversary with a new campaign featuring Gisele Bundchen, a book of photographs, various fashion shows, glamorous parties and gala dinners, launching a new fragrance simply named Anniversary on top of that. 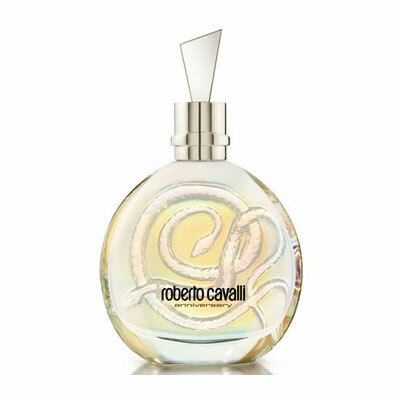 Cavalli's passion for innovation, which makes his designs so exceptional, is reflected in his personal style as well as the perfume additives. ""During these first forty years I have chased the dream of beauty. I designed clothes for women who are the ultimate expression of beauty, then I created fragrances that enhance the sensuality of women and give the pleasure of wearing a dream."" says the famous designer. Anniversary fragrance is sensual, luxurious and glamorous. It is intended for women who are wild queens, icons of fashion and extravagance. The composition opens with fresh and exotic notes of raspberry illuminated by green apple and pink pepper. The heart is oh-so-glamorous with charming notes of orange blossom, jasmine and delicate heliotrope. The base is sensual with intense cedar, patchouli and vanilla. Olivier Polge blended the composition. The bottle of this perfume is designed like the Serpentine one from 2005: round with an art-deco metal stopper. Snake, one of the most significant motifs and symbols of Cavalli design, adorns this celebration bottle that exudes subtle pearly colors of the rainbow. The box is a colored in gold, featuring a bright silver logo of the Roberto Cavalli 40th anniversary.